The early elementary level of Expressive Etudes includes 15 etudes by 10 composers which can be introduced with the second level of any piano method. The etudes in this collection are arranged in an approximate order of difficulty. Each one is short and focuses on a single musical element of a specific technical challenge. A brief biography of each composer can be found at the end of the book for further exploration. Also makes a great musical resource for older beginners and adults who need additional reinforcement in technique. Compiled to provide students with a progressive program for technical development, this first book contains 21 classic elementary studies carefully chosen for their pedagogical merit as well as their lyrical beauty. A choice series for both teacher and student libraries. Book 3 of the Expressive Etudes series expands this comprehensive program for technical development to include early intermediate repertoire, which can be introduced after the third level of any piano method. This collection provides a wonderful resource for older beginners and adults who need additional reinforcement of technique! Book Four of Expressive Etudes series includes 15 intermediate pieces which will supplement piano literature at the upper intermediate level. This collection will help develop agility, strength, and control with just minutes of focused practice each day. For all pianists, these etudes can serve equally well as performance repertoire. 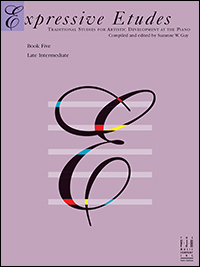 Book Five of Expressive Etudes features twenty pieces by 13 different composers. Along with a few favorites such as the C Minor Short Prelude of J.S.Bach and an impressionistic gem by Bartók entitled Dawn, this volume includes a Valse Etude by Pietro Lanciani and a lovely Berceuse written by seven-year-old prodigy Camille St. Saëns. Book Five also includes metronome markings as target tempos when the student is comfortable with the flow of each etude. Book Six of Expressive Etudes includes 19 pieces which will supplement piano literature at the early advanced level. The selections, written in a variety of tempos, textures and styles, span four centuries of keyboard studies and have been chosen for both their expressive and technical content. One example is Little Bird by Grieg, which highlights the musicality of written out trills imitating bird calls. These etudes are also a musical resource for intermediate adults who need additional reinforcement in technique. For all pianists, Book Six of Expressive Etudes serves equally well as performance repertoire.